If you are purchasing a new home, selling a property, or simply interested in learning the condition of your residential or commercial property roof, AZ Roofing Works can help. 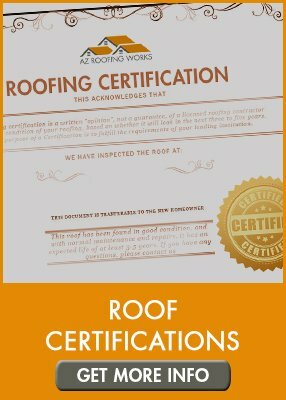 We are licensed, insured, and bonded providers of roof certifications in the State of Arizona. A roof certification is a unique and detailed process that examines the complete roof for integrity, condition, and expected longevity. Our locally-owned roofing company works with real estate professionals, commercial building owners, and home owners throughout the Phoenix Valley to complete roof certifications in Phoenix that are detail oriented, robust, and accurate. Overall condition of the roof. 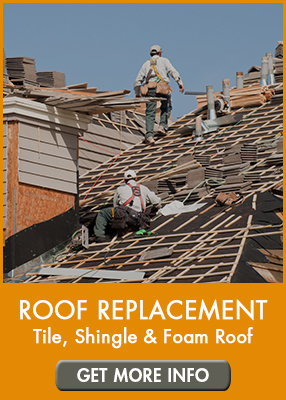 Condition/integrity of the shingle, tile or foam and the current life remaining of the roof material. Any possible broke, missing, or loose or missing roofing materials. The condition of drip edges, caps, and ridges. The integrity of downspouts and drains. The location and condition of flashing that surrounds or encapsulates HVAC systems, pipes, vents, chimneys, and other roof-based systems. Once the inspection has been completed, our roofing certification professional will inform the client of the condition, whether roof repairs or replacement is in order, or the estimated lifespan of the existing roof. This report is certified for a pre-determined length of time – ranging from two to five years. If repairs are needed, our roofing certification professional will discuss cost estimates to fix any identified repairs. Our team of roofing repair professionals can complete those repairs then issue a roofing certification based on the repairs completed. What Factors Influence the Certification and Inspection of Roofs in Arizona? The type of roof: The Phoenix valley has multiple different types of roofs including those made from tile, shingles, and flat roofs. Each type of roof design is likewise made from specific materials that also require unique inspection criteria to be followed. The age of the roof: As each material is unique, so is the age of the roof. As roofs age, they are susceptible to wear and tear due to exposure to aggressive temperature and weather-related conditions. A good roof inspector understands the how age impacts its condition, and how it should appear. The roof pitch: The angle of the roof also has a big determining factor. When the pitch is built at a higher angle, it will impact the certification process. Total number of layers: Different types of roofs have unique layers. However, this is usually based on re-roofing. Each US State has individual rules about how many re-roofing projects can be completed before a full tear-off and roof rebuild is necessary. Why is a Roof Certification a Good Idea? The primary of a roof inspection is to inform the buyers or sellers of the condition of a roof, disclose the condition and life-expectancy, and to make repairs if needed in order to complete the certification process. This is beneficial to home buyers, sellers, real estate professionals and more. By having a professional roof certification company in Phoenix complete all phases of this vital process, home sales can be expedited, transparency is accomplished and all-parties will have a solid understanding of the actual condition of their roofs. AZ Roofing Works is a Licensed, Bonded & Insured Roofing Company located in Mesa, Arizona. 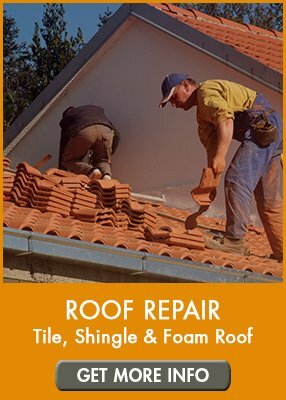 We are the preferred residential and light commercial tile, shingle, foam, and flat roof repair and roof replacement company serving the Greater Phoenix Arizona area. We offer roof certification services for tile, shingle, and flat & foam roofs throughout the valley. Whether you live near ASU, off the 101 or I-10 – our team of passionate and experienced professional roof certification experts will cater to your needs. Our dedication to craftsmanship, getting the job done right – the first time, and our dedication to open and clear communication are trademarks of AZ Roofing Works. We offer Experience You Can Trust – and we offer FREE roof estimates all the way to full roof replacements and everything in between. If you are in need of any roof repair service in Mesa, Chandler, Scottsdale or any other Metro Phoenix location, AZ Roofing Works is ready to help you! Contact us today, either online or call our office directly at (602) 283-3383.